Available in Afternoon Tea Volume Two! Dimbala was the last sweater that I knit for Volume Two – I was working on it right up till the day before the shoot! I’m glad I got it finished though, and I’m really proud of it. The shape was inspired by jumpers of the 40’s and 50’s – slim, with a tidy waist and cropped length. I had picked up this colour of Cascade 220 awhile ago and was trying to come up with something to knit with it. I’d had my eye on this stitch pattern for ages, and once I swatched it up, it was a perfect fit! 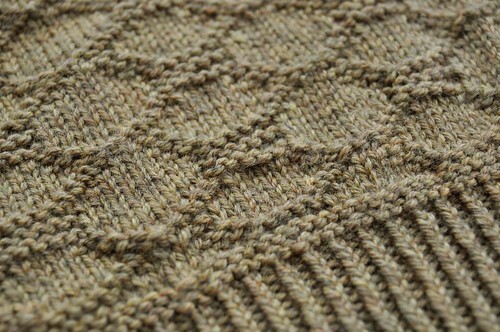 Cascade 220 has great stitch definition and is so easy to work with. I love the heathery-ness of the colour. I LOVE the little skirt from Freedom Clothing Collective and the polka-dot tights that Jasmine paired with the sweater! The sample was knit for Angela’s size (she’s a bit smaller than me) so I might just have to knit up another one for myself. 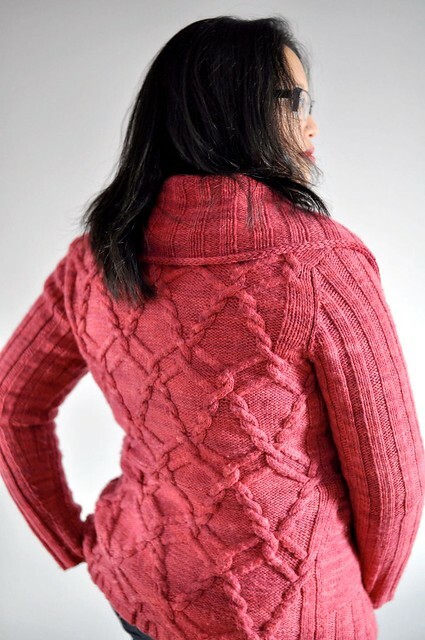 To purchase the pattern, check out Afternoon Tea Volume Two or Dimbala on Ravelry.